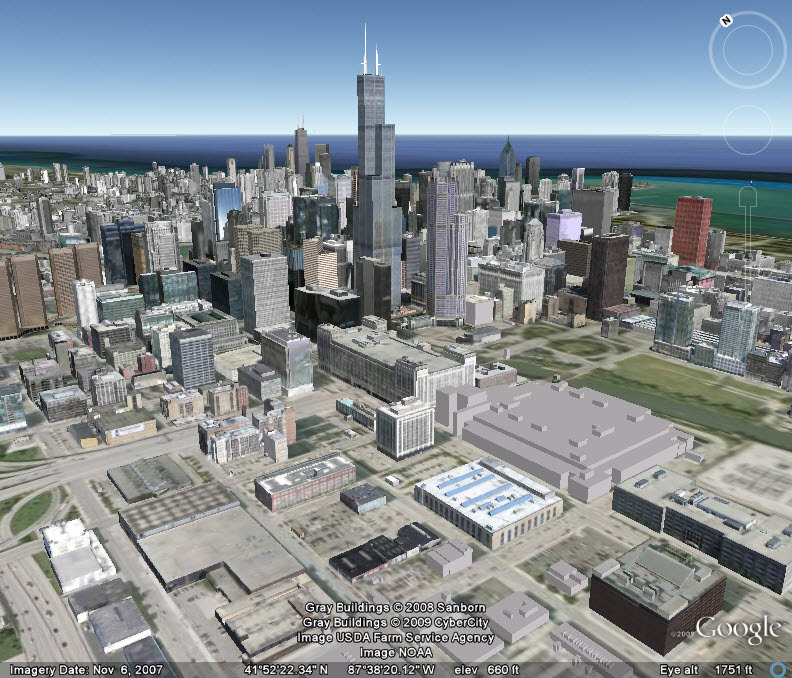 Since we released Google Building Maker several weeks ago, we've seen a large inflow of new 3D models. Great job! If you've been following our posts (or Tweets), you might be wondering why we're introducing new cities in Building Maker in the same locations where we have existing 3D buildings in Google Earth. It's pretty simple really, but allow me to explain. If you explore any of the cities currently in Google Earth you'll notice that there is a blend of 3D data from multiple sources, including Google-created, contributed (by cities and local governments), and community-generated (geo-modelers using either SketchUp or Building Maker) buildings. The Google-created buildings act as a base layer. While these models are an accurate depiction of the real world in their current form, we consider them to be a starting point upon which the geo-modeling community will update and improve them with higher quality models, with rich metadata about the buildings. I liken the "3D Buildings" layer in Google Earth to a giant 3D wiki, which, by definition, "allows visitors to easily add, remove and otherwise edit and change some available content." 1. Photo-textured models that meet our quality standards will automatically replace untextured models, regardless of source. 2. Photo-textured models, generated in either SketchUp or Building Maker, are reviewed against a Google-created model (if one exists), and, if it's of comparable quality and completion, we will always choose the hand-drawn model over the Google-created one. Whether you're a new Building Maker user or an accomplished SketchUp user, the key thing to remember is that the best model should always win. Will we replace the Google-created buildings with user-generated buildings? You bet! The source of the model is irrelevant. What's important is that we're all working together to collaboratively build a virtual representation of our world. So, keep on modeling. We look forward to seeing your creations come through the pipeline! Let's work together to create a 3D world! This is not true in my case. The one of my house(done with GBM) was *much* nicer then the crappy and inaccurate one which has replaced it. What do I do about this? is there an arbitration service? You can appeal a judgement my going to the bottom of your model's details page and clikcing the "Think this review is incorrect? Tell us why we're wrong" link and then filling out the form. Someone will carefully compare your model with the one live in earth and will either reverse the decision or give you feedback on why your model wasn't selected as the best model.